It was hot. It was humid. It was fantastic. Let’s just say I was there from start of day until close of business and I do not do festivals/large gatherings of people well at all. I’m the hermitty type most drawn to Michael Leunig’s favoured “…Festival of Clouds/the festival that doesn’t pull the crowds”, so for me to put in eight solid hours at a festival says something about the event. 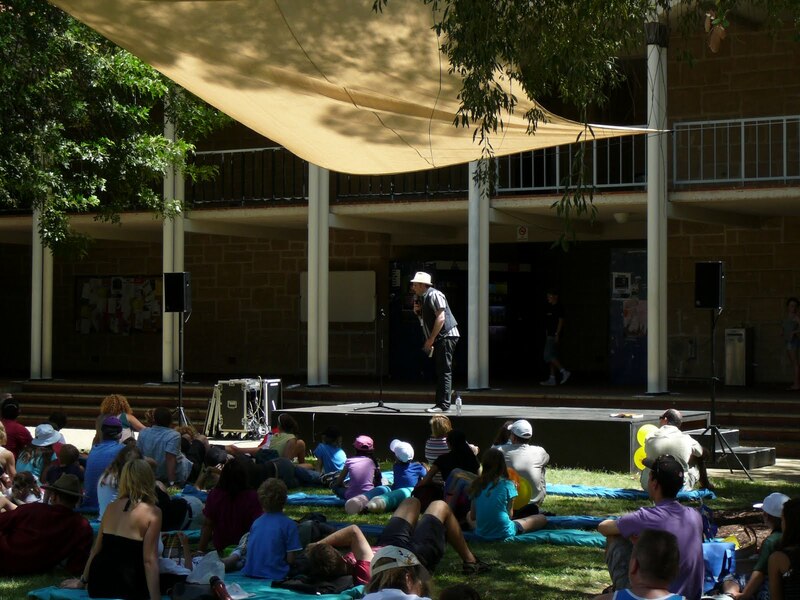 We spent the day outside under the trees, as writer after writer appeared before us on the Kids’ Courtyard Stage (I presented there last year, at midday, in similar, soupy conditions, and let me tell you it is much more relaxing lying back on cushions on the grass, in the shade). This entry was posted in Events and tagged festivals, Perth Writers Festival on February 28, 2010 by Meg McKinlay. Six days of poetry workshops, readings, panel discussions, book signings, and reader-meeting are over. It was both excellent and exhausting. I met some wonderful writers, read some poems, sat in on all kinds of lively discussions, and got to talk about Going for Broke to a lovely al fresco Family Day crowd. If you came past to say hi or have me sign a book, feel free to drop me a line via my ‘Contact‘ page. I always love hearing from readers. Something else I love is turning up approximately three minutes late to a panel discussion on short fiction and finding standing room only at the (large-ish) venue. It is a real pleasure to be part of such a vibrant community of readers and writers. Thanks to everyone who helped make it happen and everyone who gobbled it up with such gusto. Please, sir, can I have some more? This entry was posted in Events, Going for Broke, Poetry and tagged festivals, Perth Writers Festival on March 2, 2009 by Meg McKinlay. The program for the Perth Writers’ Festival has been released. I’ll be presenting at tw o sessions – during Family Day on Sunday, March 1st, and at ‘Lyrical Voices’, a poetry session on Monday, March 2nd. This entry was posted in Events and tagged festivals, Perth Writers Festival on February 7, 2009 by Meg McKinlay.